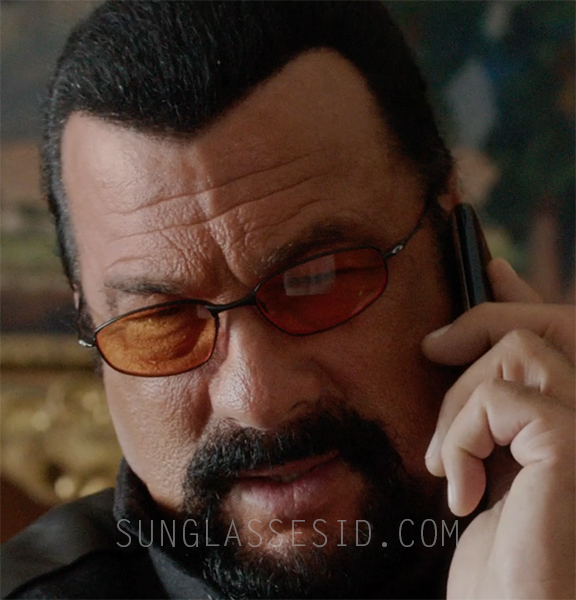 Steven Seagal wears Oakley Whisker sunglasses in the 2015 action film Absolution. These wireframe glasses from Oakley have a black frame and (custom) dark bronze lenses. The Whisker is not available anymore on Oakley.com but you can find the frame on FramesDirect.com or there's a large selection on eBay. Absolution (also known as The Mercenary: Absolution) is a 2015 action, crime film directed by Keoni Waxman, starring Steven Seagal, Byron Mann, Vinnie Jones, Josh Barnett, Adina Stetcu, and Massimo Dobrovic. The film is a sequel to A Good Man (2014). Steven Seagal wears the same sunglasses in the movies Code of Honor and The Perfect Weapon. Reference: Oakley Whisker, black frame, dark bronze lenses.